Today was a good food day. Me Darlin' Mrs and I got up early to make it in time for a seat (two of about 10) at the Colossal Cafe. Sunny-side up eggs, bacon, hash browns and toast were transformed from simple morning staples to new heights. The eggs were right on, the bacon was cooked crisp with a touch of cayenne and black pepper, the hash browns were acutally hash browns, not hash tans or hash whites. The toast was awesome; home made bread that was freakin' grilled. Buttery, golden brown on one side and still warm and soft on the other, or as Mrs Yam said, it was toastvana, the best toast she's had in a long time. She's a toast junkie, so if she says this is good toast, it's good toast. This is an example of a simple meal prepared with such skill and grace that it transcends into a meal to remember. Thusly fortified, I went to work at the liquor store. On my way out, I asked my boss, "I'm having steak tonight, what is something that I have to try?" Bryan, someone whom has never failed me, recommended a marvelous Cabernet Sauvignon by Ghost Pines. The subtle tannin loomed in shadows, never announcing its presence, but you are fully aware of it nonetheless. It tasted of blackberry and dark plum and sour cherry. There may have been other flavors, but I think I over-seasoned the surloin to catch any other notes. Dinner consisted of the prime dry-aged surloins, cooked on a hot cast-iron skillet au poirve style (with unfortunately too much salt), carrots with ginger sauce (see recipe below) and green beans with mushrooms and a Balsamic vinegar reduction sauce. We also baked up a rye bread from the Healthy Bread in Five Minutes a Day for our fresh loaf. Melt the butter over medium heat and saute the ginger, mustard, cayenne and cardamom seeds until fragrant and the ginger is soft (about 5 minutes). Add the carrots and the olive oil and turn the heat to high to cook the carrots until they start to soften (about another 5 minutes). 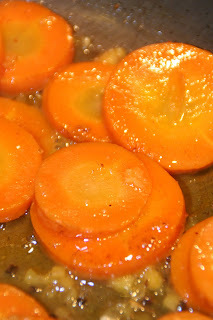 Add the honey and water, reduce heat to low, stir to incorporate honey into the sauce and cover and cook the carrots until they are cooked until they are mostly soft, like an al dente (about 10-12 minutes). I'm not a vegetarian; I may not be a dedicated carnivore, but I will not deny myself meat. Dinner to me is quite a bit different than the slab of steak and an ignored vegetable that passes for fine dining for a good deal of my Midwestern neighbors. Typically, meat is more of a flavoring, an adjunct to the entire meal than the star. Curries, burritos, soups, stir fries, salads, etc. will all include meat but they are not typically the main focus of the recipe or meal. I take the ingredients with which I cook seriously, I like organic and/or heirloom vegetables and fruits not because of some esoteric desire for the good of the planet, but because they generally taste better. They were grown with care from good stock and it shows up on the plate quite readily. The difference between the tomatoes I grow (as an example) and the sad, hard, tasteless tomatoes found in a typical grocery store is a difference that can be measured in orders of magnitude. And no, you're not going to find heirloom tomatoes now -- hence eating them when there plentiful. If you can't eat them fresh, it's time to learn to can and save the flavor until the next fresh batch ripens like our ancestors did. I've ordered dry-aged, grass fed and grass finished beef from my rancher friend Brad Crabtree at Echo Lake Ranch. I've purchased from him before and I've never been unhappy with his products. He cares about his land, his animals and his livelihood. Considering the cost of dry-aged beef and what it could cost you (think of the price of steaks at Manny's downtown), Brad's meat is a steal and I'm perfectly happy to have a freezer full of it for the price of four dinners at the venerable steak joint. Granted, the cuts don't run over about 8 ounces, but who the hell can really eat a 25 ounce cut of meat (shut up, Chuck)? More importantly than the dry-aging and the hippy farming is the fact that I know the rancher. I trust him and I know that what I'm ordering is the realy thing. There are no legalistic clauses such as "access to pasture." The sheep and cows live off of the land that Brad takes care of and that land takes care of Brad and the cows and sheep. This is real ranching without the need for fuzzy phrases; his love of what he does and the happiness of the animals under his care are testimonial enough to show the meaning of "organic" or "grassfed" or whatever name you need to use show that quality is will show through whatever language or frame or reference you choose. There are plenty of health benefits of eating animals that lived as they always have. This great hunt that has developed for Omega-3 fats is silly, beef has all the Omega-3 you need. But not just any beef, but cattle that has grazed on grass. Cows don't eat corn and can't digest it. The CAFO (concentrated animal feeding operation) has taken a cow and placed it into an alien environment and it shows. These poor critters don't get excercise, fresh grass but are forced to stand around in a toxic mix of their own waste and mud, eat a corn mush full of vitamins and antibiotics (necessary due to standing around to the overcrowding and standing in their own filth). This makes it cheaper to grow cattle, but we are starting to see the effects of this economy scale and the hidden costs are staggering. So, I fight against it in my own lonely little way. A handshake and a welcoming embrace from Brad and a couple of boxes of what was once a happy cow. Butchered carefully by people not under any pressure to process a certain number a day so there are no feces-flecked walls and wounded workers. It is more expensive, but the costs are more true to their real value. Perhaps it is more expensive, but in the end it is a real value. Grass-fed and grass-finished, prime, dry-aged beef for $6-$7 pound. Compare that to upwards of $25 a pound from the grocery store. The cattle live better, the grass grows better, Brad has a job he loves and I benefit from the happy chain. Win-win-win-win. It's a deal I can live with, and so can others.